Hot on the heels of a significant Windows 8 Mail app update, Microsoft's Xbox team is releasing a new version of Xbox Music. The update brings performance improvements on the RT side, making it a lot more usable on devices like the Surface RT. Speed aside, Microsoft has also added in independent volume control for Xbox Music, meaning you can let the app play quietly in the background while the system volume remains louder. 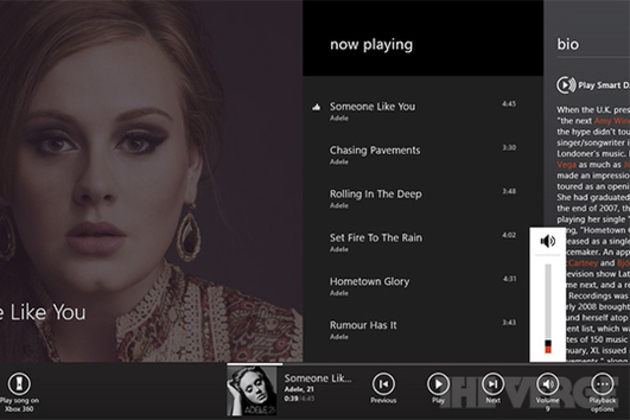 The latest Xbox Music update also simplifies control over music in the cloud. The preferences panel lets you add songs from your collection and have them replicated on other Xbox Music devices, and there's also an option to automatically add matched songs from PCs into music in the cloud. Other minor tweaks include a refreshed now playing UI that now lists all the tracks from an album alongside the song currently playing. The update is available immediately in the Windows Store.